“You remember that away game against the Dolly Rockits?” one of our Rockers contacts asks. How can we ever forget it, taking place as it did in a greenhouse in the countryside on the hottest day of the year. “Well, the Lille game was even hotter.” Jeebers. The Dollies game was so hot it caused us to hallucinate profusely (see the report on this site from last July for the evidence). Thank goodness we didn’t manage to make it over to Lille then, or this report would likely be a long row of gibbering noises occasionally punctuated by “how much water can you get out of a goldfish” and “there’s a BBQ in my head and it’s been left unattended, aaargh!” We still want to cover the game though, so we’ll be relying on the rather less frazzled recollections of a few Rockers to piece together this report. With The Mighty Mighty Bash as mighty mighty bench coach and Maudeo Fondeo on line-ups (a partially redundant role in the circumstances), Brighton get off to an early lead. At one point they’re 60 points up. Switchblade have a full fourteen to chose from, but tend to alternate between two pack line-ups, one of which is more muscular than the other and proves tougher going for the Sussex jammers. Emma and Foxx are up against the more physical pack in the first half, with Mistress and Enyo facing them in the second period. 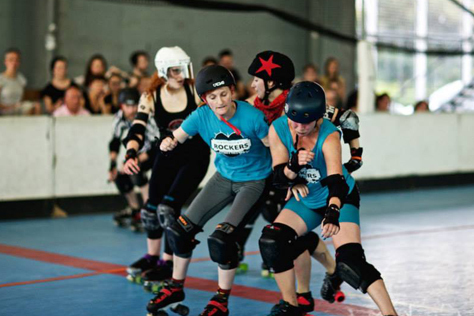 Both sides are penalty heavy, and as the game progresses, the numerically disadvantaged Rockers squad start to tire faster than their opponents. It’s particular tough going for the jammers, of course, and star passes are more frequent in the latter stages of the game. “I just couldn’t carry on in the star in one second half jam,” one player tells us, “as I was spent in the heat. Unfortunately my mouth was so dry that I couldn’t ask our pivot if she’d take the star from me. I tried to say it on several passes, but no words came out, so I had to carry on jamming. Aaagh!” In another case a Brighton pivot sees her jammer is in trouble and desperately asks for the star, but again heat and pace prove barriers to conversation. Emma jams the last six or seven outings for one Rockers line-up as Foxx retires into the (relative) sanctity of the pack. Brighton had gone into half time a couple of dozen points ahead, but their lead is overhauled in the second period, and the bustling Switchblade side take the game 171-136. “Switchblade were thrilled to take the win and it was good to be able to celebrate that with them,” another player tells us. Brighton also sold a huge amount of merch at the game, a testament perhaps to the standing UK derby has on the continent – that and the Rockers’ awesomeness, of course. To some extent, a large part of the game’s raison d’etre from a Sussex perspective was the blooding of players, and the debutants all fared well in trying circumstances. The most debutanty of all, Irish Mist, earned a lot of praise for going the entire game (playing in virtually every other jam, remember) without picking up a single penalty. Extra impressive given that a number of far more experienced players, mentioning neither Racey nor Emma’s names, came very close to fouling out. The journey across on two minibuses via the Tunnel went relatively smoothly – the field hockey taxi diversion and a mild amount of getting lost excepted – but the return journey involves smuggling one player back into the country (she’d left her passport in the apartments the Rockers stayed in). This mixed level side, or other variants like it, are hoping to play a few more games this year and beyond, both home and away; hopefully with more than ten players, though. Despite the defeat, the Sussex side had a very enjoyable weekend away and would like to pass on thanks to all the Switchbladers, particularly GabriHell and ref Nellie R’Oleson, for their hospitality. The game in Lille may not have been a walk in the park, but a skate in the park is next on the agenda for Brighton. The Rockers will be at Active Sussex in Preston Park tomorrow (Saturday 21st June) so pop down and say hi. They’re also offering a free derby taster session at the King Alfred on Monday (23rd) 8.30-9.30pm. 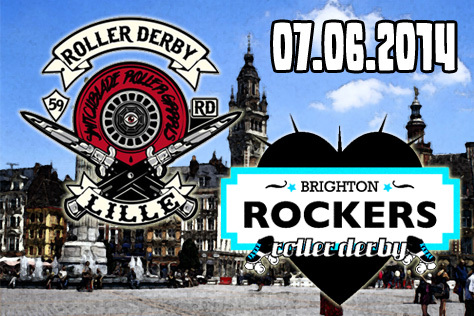 E-mail info@brightonrockers.com for more information. 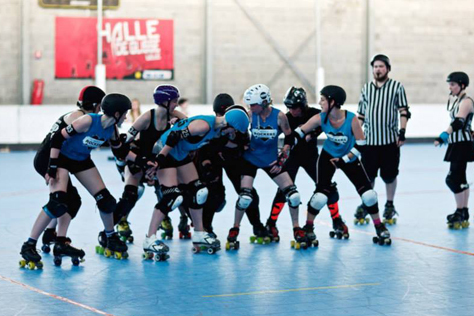 Switchblade, meanwhile, are pitting their B-team against Valenciennes in Lille this Sunday. As for the Brighton Rockers first team All-Stars, they’re back in action on Saturday 26th July with a home match against near neighbours Croydon Roller Derby at the Dolphin in Haywards Heath. Tickets are on sale now – see below for links. Ça change. It’s fair to say that France came a little late to the Euro derby party, and whilst the country is a major force in the (overall late-to-the-party and much mutated) men’s game – second only to England in Europe, by all reasonable metrics – in proper/traditional/women’s derby the French have long been playing catch up at club level to nations like England, Sweden, Finland, Scotland, Belgium, Wales, Denmark… until now, at least. This past weekend in Gent, at the closest thing to a ‘top ten’ tournament that Europe currently stages, the Paris Rollergirls – the most underrated, most exhilarating and mostly sheerly joyous to watch roller derby team this writer has ever seen – took the trophy. Paris went into that tournament ranked 8th out of 10, had to play one more game than everyone they met, and… they shredded, with the liveliest jammers, the best positional blocking, the smartest tactics displayed by anyone in the tournie. “This is Paris RG coming of age,” many tear-filled viewers of the live stream posted. Maybe more than that. Maybe that was French roller derby coming of age. The sport has permeated almost every corner of the Gallic land these days. Indeed, the team that the mighty Brighton Rockers travel across – or under – La Manche to face on Saturday are one of several in Lille, the country’s fourth (or fifth, depending on who you believe) biggest city. 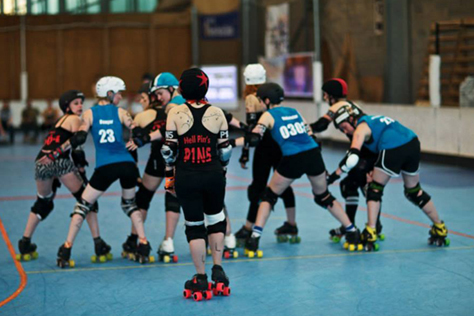 The Switchblade RollerGrrrls, part of Roller Derby Lille, are the region’s oldest club, and have ambitions to take on some of the best sides in Europe, starting with the Rockers. Brighton aren’t sending over a full All Stars (A-team) roster for this match, which is probably wise in terms of making a contest of it. The flattrackstats predictor gives the Rockers a 99% chance of winning such a game, with an expected scoreline in the region of 250-60. Even the mixed level Brighton side travelling over should be clear favourites, but all indications are that Switchblade are well up for this contest, and the Rockers squad should expect to have to fight hard for every point. As for Lille itself, many only ‘know’ it from travelling through, Eurostarred en route to Paris or Brussels, and imagine the uninviting modern shopping centre visage around Lille Europe station is representative of all the city contains. We were lucky enough to spend a few days here a couple of years ago (for a Leonard Cohen gig, yeah) and consider it one of the friendliest and most picturesque places we’ve visited. Whilst that Euralille shopping centre has its purposes – load up on cheap booze and tobacco in the Carrefour within – the old town to the North West of the train stations is a beautiful mess of red bricks, cobbles and squares. The Northern edge of the centre is canal-ringed and home to the iconic Citadel army base, together with a zoo that we were expecting to be rubbish, given that it’s free entry, but which actually includes – rather than a few rabbits in boxes like we expected – large swathes of natural habitat with all zebras and that in, should the whole idea of a zoo not be anathema to you. Hi. 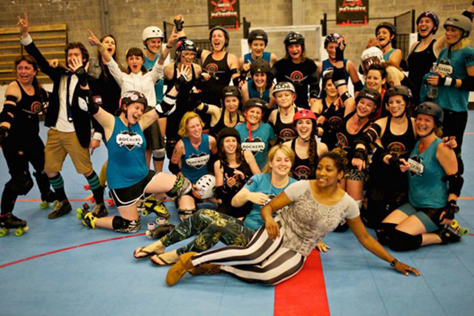 For anyone who doesn’t know Switchblade RollerGrrrls, can you tell us a little about your history so far? Are there any Switchblade players/tricks that people should look out for? Do you know much about the Brighton Rockers? What are you expecting from the game? Some of us saw them play at Gent in Belgium many months ago. They are the first British team we’ll meet on the track. 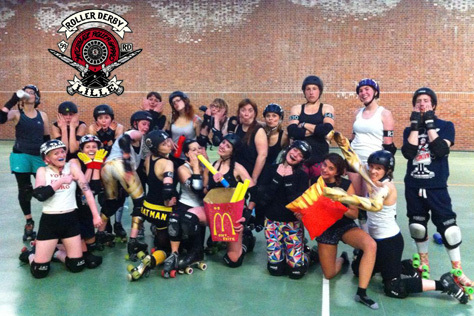 We do follow a lot of the best-known teams such as Tiger Bay Brawlers and London Rollergirls (four of our players went to ‘Anarchy In The UK’ a few weeks ago). 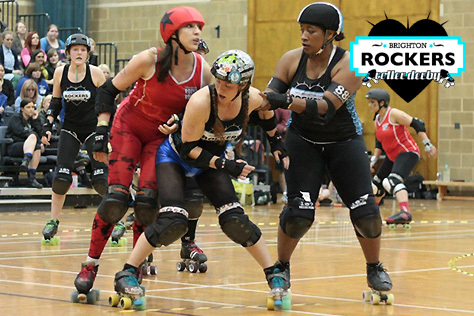 Roller derby has developed much faster in Britain than in France, and we are just as much interested in making this event a cultural exchange as a sporting exchange. The game is an enormous challenge for us, but it will be a great experience. We’re sure to be able to learn a lot from it, and of course we’ll do our best to win! What can you tell us about your venue? Is there a bar? Also, what kind of after party can people expect? Finally, for anyone staying over for the weekend, what is there to see and do in Lille? Hi. We understand the team travelling over to Lille is going to be a very different kind of line-up to what we’re used to. Are there many All Stars involved? Anyone making their debut? Yes, this is going to be a very mixed team. The likes of Racey, Emma the Condemner and Anti-Gravetty will be playing, and it will be my first game back since returning from injury. We currently don’t have a full B-team, so we have chosen the roster with a mix of some experience and some relative newcomers. Obliviator and Banger will be making their debuts as Rockers, and Irish Mist will be skating in her first ever bout! What’s the thinking behind putting out a mixed team like this? Are more games featuring this type of line-up planned? 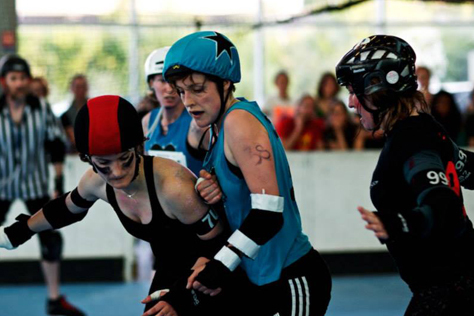 We want to be able to offer bouting opportunities for our up-and-coming skaters. All Stars games are high level, high pressure events with the focus on presenting the most skilled team we have to offer. We have several games scheduled this year that will include a mixed level roster, for our newer skaters to be able to play and have fun in a less pressurised atmosphere. Does more organisation go into playing games outside the UK? What are Rockers road trips like? We have an excellent travel committee that organises our transport and accommodation. Other than making sure everyone remembers their passports, it’s very similar to playing those away games within the UK that require us to travel significant distances. We have made several road trips as a team and they can be pretty epic! 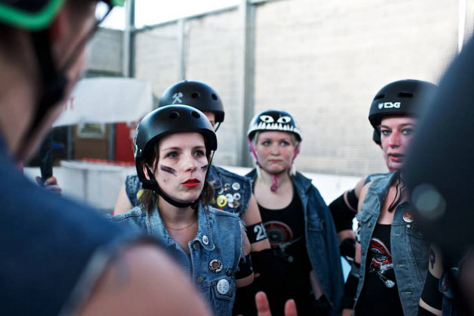 Do you know much about the Switchblade RollerGrrrls? What are your expectations going into the game? I personally don’t know much about them, but we have watched some footage of their games. They’re an up-and-coming team and we’re very much looking forward to playing them. The game starts quite late (8pm). Are there any fitness/logistical issues that come with that? It is unusual for us to be playing an evening game, and we will be travelling there that day, so our preparations will be slightly different than what we are used to. Mostly, we will just ensure that all of us are well fed, hydrated and have the time to stretch our legs after being on the road for so long before the game. Finally, will there be many more home games in 2014? Any of these likely to feature a mixed level Rockers line-up like the game in Lille? We have several home games planned for the rest of 2014, with the next one being the All Stars against Croydon on July 26th. We do have some mixed level games on the schedule. You’ll just have to wait and see! Please note: We may not be able to provide a report for this game. Check out the Rockers and Switchblade on Facebook and Twitter for scores and more.